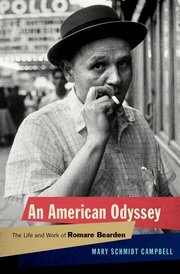 An American Odyssey: The Life and Work and Romare Bearden. Oxford University Press, 464 pp. $34.95. As the third decade of the 21st century swiftly approaches, it might be difficult for some fine artists under 35 to understand a time when the self(ie) was not unapologetically at the center of the artistic experience. The first biography of Bearden in almost 20 years, and clearly the fullest, Campbell–who knew the author, trading letters with him going back to the 1970s–has crafted a quality book about 20th- and 21st-century Black ritually- and visually-based aesthetics through American history’s prism. (The fact that, as Campbell writes, “Bearden seemed to delight in exploring the use of color” has a acute, and subtle, significance.) With a lack of dangerous 20th century socio-political action and adventure to reconstruct, Campbell, president of Spelman College and a former leader in the New York City artistic community, must go around and through the topic, briefly profiling the many artists in his orbit, such as Aaron Douglas, Charles Alston and Augusta Savage. She documents well, and with great care, his artists’ organizing efforts, his many important writings and his forgotten early-political cartoonist career. What was most important to this reviewer is her detailed, and thoughtful, placement of Bearden at the slow-but-perfect storm of the development of 20th century American media, technology, popular culture and racial struggle. Although Campbell’s theme of the Black American Odysseus is sound, this book is actually about how someone fed on the European art classics and the organic African-American experience (of Harlem and Pittsburgh) slowly realizes something when the latter becomes in vogue in the 1960s (perhaps not-so-coincidentally), allowing him to ultimately collage his being fully as both an artist and a Black man: that being and presenting one’s Black self in New York City, the then-new center of the art world in the center of the century, forever seeing and remembering, is more than profound enough.